Have you been told your lyrics sound like poems? Or that your lyrics should sound more like poems? Poetic language is something that appears in most great songs. They utilize poetic devices like similes, metaphors and imagery, but they stay away from being “poems” – and there’s a reason. Poems are things read on a page. A song doesn’t benefit from that luxury. So what are the real differences between a poem and lyrics? And how can knowing them make you a better songwriter? 1 Rhyme is sort of optional in poetry. In song lyrics no rhyme can create confusion. Free verse is pretty common in poetry. And it works, because on the page a reader can see where the lines and stanzas end. Even at a live reading, poets have a cadence that makes it clear where things end. A song with no rhyme would be difficult for a listener to follow. Sure – the melodic structure and contrast created between a verse and chorus or bridge would be an indicator of “place” in the song, but if that is the only marker – who’s listening to the words? Rhyme is a key element of a song because it (1) helps move the listener through the song by “connecting” things, (2) creates a bit of a road map to where the listener is at in the song, and (3) it helps you reinforce the contrast of your melody and accompaniment. 2 Poems allow readers to go back – reread. Songs are impatient to get to the end! A song flies by in a matter of minutes. Sure, you can hit the replay button, but doing it on every word makes you a terrible road trip companion. Being short, clear, and precise with your intent is key to a song “coming across” on the first listen. Poems are often much more subtle and require a reread to find the nuances of the poet’s intent. Sure there are live readings, but you can hear a pin drop! You’re locked on every word, because there aren’t multiple elements to consider and process, unlike a song. Poems have “forms” which songs can leverage, but songs tend to have an emphasis on repetition as a key element. A chorus is used to deliver the “big idea” after each scene (verse) or the twist/explanation (bridge). In A A A songs, a refrain is often used to stress the “big idea” and connect the verses by using the refrain at the end of each. This repetition not only reinforces the song’s idea, it also gives the repeated words or phrase more weight within the song and consequently, each time it’s sung. The songwriter’s intent comes through because the chorus or a refrain is separated and highlighted by being repeated 3 or 4 times in a three minute time frame. Poems rarely repeat whole sections unless it’s a ballad form – a coincidence? 4 Poems have visual indicators of a thought ending – songs rely on auditory cues. Poems use punctuation to make it clear what’s happening and how you should be “reading” the sentence. Songs don’t have these road signs. Notice I called them “cues.” They’re subtle because you have to hear the cues in the music or the lyric. For example, in a poem if a thought is continued onto the next line you can see it didn’t end because there’s no punctuation. Having a thought continue onto the next line is powerful in a poem, because it creates tension within the poem. In a song, it often creates confusion. There’s an art form to sustaining an idea across a couple of lines in a song that requires the music take the continuation into consideration and create an indication for the listener. Unless it’s done well, the listener will miss it. Then you’ve got an idea that’s done and a new idea (to the listener) that’s not a new idea at all. Result? Confusion. 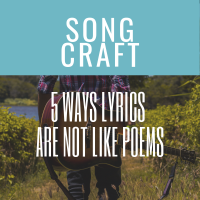 5 Space limitations don’t exist for poems, but for songs airplay means short. While some poetic forms do have set structures and therefore space limitations (e.g., my favorite terza rima), poems can go on for as long as the poet would like to achieve their poetic goal. If it’s exploration of a subject until they’ve come to a discovery of it’s core meaning for them, they can take eight pages. J Edgar Proof rock is a great example. Songs have about 3:30 tops if you’re looking for terrestrial air play. Knowing how to write poetry is a great tool to becoming a good songwriter, maybe even a great one. But, understanding the differences is what can make your song better. Too much poetic language, resulting in a story or idea that can’t be followed, will only alienate your listener. There’s a balance you’ll need to find. And don’t get me wrong. I’m a huge believer in imagery, figurative language and all the things that bring emotion into a song. I don’t write sparse lyrics myself – so I’m not saying you should. What I’m saying is, consider the genre of the song as well as the audience and write to it using your song vs. poetry knowledge.